We are cheaper than Amazon! 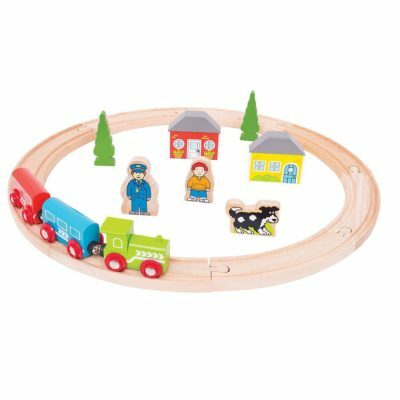 Young minds will have great fun playing with this delightful wooden train set from Bigjigs Rail – the ideal beginner’s train set for young railway enthusiasts. Inspiring hours of creative play, this entry-level wooden train set will open young minds to an endless world of adventure. This 20 piece set comprises of 8 pieces of wooden track, an engine, 2 carriages with magnetic couplings, plus freestanding items including houses, trees and figures. Youngsters will be able to create a unique travel scene with each play. Additional accessories are available to expand this set. Most other major wooden railway brands are compatible with Bigjigs Rail. Made from high quality, responsibly sourced materials. Conforms to current European safety standards. Age 3+ years. Diameter: 440mm (assembled). Consists of 20 play pieces.To add a road-rail interface we have included a car transporter unir as well ! 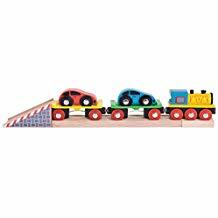 The Bigjigs Rail range is one of the most complete wooden railway systems available. 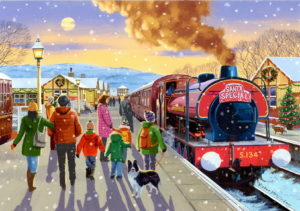 A comprehensive range of wooden railway products (including train track, train sets, trains, train tables and more) make Bigjigs Rail the perfect choice when starting or extending a wooden railway network.Founded in June 1985, Bigjigs Toys is a family operated business which has never lost sight of its roots. 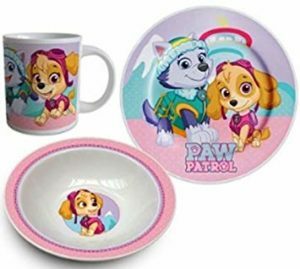 Its mission is to deliver quality, safe and affordable products, which are responsibly sourced and complement childhood through fun, exploration and learning. We believe that the best toys are powered by creativity and imaginative play and strive to produce toys that are cherished and enjoyed for years to come.